We were all buckled up to weave an in-depth comparison of the outdoor belt space, but Arcade’s Futureweave caught the competition with their pants down. Comfort and unrestricted movement are paramount in all outdoor apparel, followed by durability and versatility, and Arcade’s Futureweave gets top marks in every category. The Futureweave is ridiculously stretchy and totally supportive at once, lightweight, low profile, and even hydrophobic. As a bonus, given that woven belts are typically hideous, the Futureweave might also be the best-looking woven belt ever made? Given the criteria above, we ruled out any belt without stretch, which eliminated Arcade’s Guide, and both Mission Belts. That’s not to say both companies don’t make belts we wouldn’t be happy to put in our everyday rotation, we just don’t want stiff leather around our waist on our next hike. 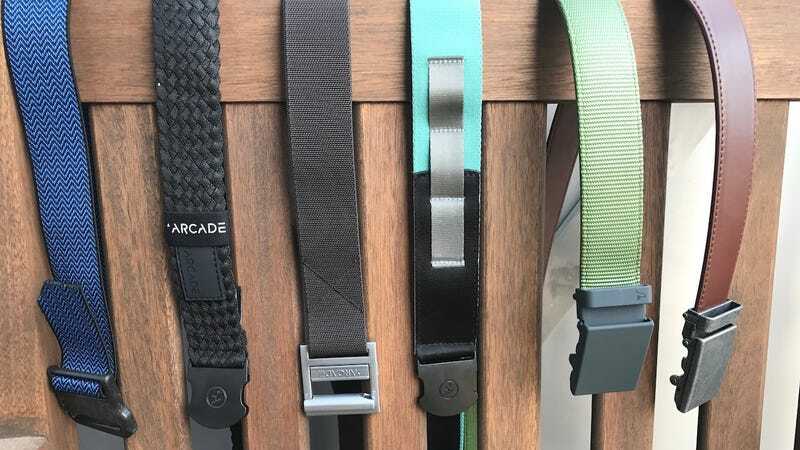 We love the look, feel, and fun designs of Arcade’s Adventure Belts, but they’re only $2 less than the Futureweave- not that all these belts aren’t impulse-priced even at MSRP, and the Nomad variants have built-in daisy chains to help tote some gear. Yaak Design B- Series belts make a very strong showing, with carbon fiber buckles, water resistance, stretch, and good looks, but if we have to choose we prefer the satisfaction of snap buckles and the stretchiness levels of the Futureweave. Abl is also more expensive. Update 4/20/18: Yaak Design has launched their M-Series belts, which feature an awesome magnetic buckle that we now wish every belt had. If you’re not bringing stretch, you better be bringing added functionality to the table, and we’ll be testing that strategy out soon with SlideBelt’s Survival Belts and SOG’s multitool belt buckles.